Exitianus capicola, copyright Pierre Gros. 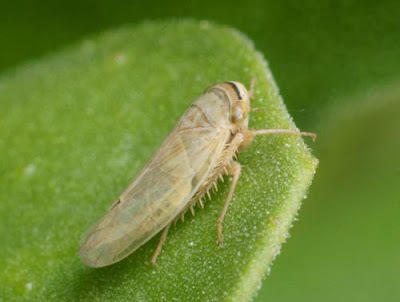 The Athysanini are a group of leafhoppers characterised by having ocelli situated dorsally on the head on the internal side of the laterofrontal sutures, and a Y-shaped connective in the male genitalia (Fletcher & Moir 2008). [FM08] Fletcher, M. J., & M. L. Moir. 2008. Gunawardenea, a new genus of squat leafhoppers from Western Australia, with description of two new species (Hemiptera: Cicadellidae: Deltocephalinae). Records of the Western Australian Museum 24 (4): 429–436. [GF13] Gopurenko, D., M. Fletcher, H. Löcker & A. Mitchell. 2013. Morphological and DNA barcode species identifications of leafhoppers, planthoppers and treehoppers (Hemiptera: Auchenorrhyncha) at Barrow Island. Records of the Western Australian Museum Supplement 83: 253–285. [H01] Horváth, G. 1901. Hemipterák [Hemiptera]. In: Horváth, G. (ed.) Zichy Jenő Gróf Harmadik Ázsiai Utazása [Dritte Asiatische Forschungsreise des Grafen Eugen Zichy] vol. 2. Zichy Jenő Gróf Harmadik Ázsiai Utazásának Állattani Eredményei [Zoologische Ergebnisse der Dritten Asiatischen Forschungsreise des Grafen Eugen Zichy] pp. 245–274. Victor Hornyánszky: Budapest, and Karl W. Hierseman: Leipzig. [K08] Kirkaldy, G. W. 1908. A catalogue of the Hemiptera of Fiji. Proceedings of the Linnean Society of New South Wales 33: 345–391, pl. 4. [L61] Linnavuori, R. 1961. Hemiptera (Homoptera): Cicadellidae. In: Hanström, B., P. Brinck & G. Rudebeck (eds) South African Animal Life: Results of the Lund University Expedition in 1950–1951 vol. 8 pp. 452–486. Almqvist & Wiksell: Uppsala. [M83] Martin, N. A. 1983. Miscellaneous observations on a pasture fauna: an annotated species list. DSIR Entomology Division Report 3: 1–98.